"FirstNET" NO! Please Consider, it is because [BCuz] the Police & Fire & Utility services NEED to use "our" roads - at all! - that "our" roads are maintained - just as good - as the "Rich People's" roads. https://firstnet.gov/about :: mailto:stu.davis@das.ohio.gov < Ohio :: mailto:info@firstnet.gov < USA :: USA-Commerce Committee :: CAN "political views" be broadcast - FOR FREE - on the NEW "TRUMP" BBNETWORK?
" *** " Meet Mr. Ajit Pai"
Ajit Pai is often modest about his achievements. From the outset of our interview, he credits his parents for inculcating in him the values of hard work, education, and family. It seems his life has always revolved around regulation. Born the son of Indian immigrants in Buffalo, N.Y., his family moved to Canada when he was four months old. His parents left Toronto after completing their medical residencies, fearing the regulatory environment would hamper their career aspirations. "One of the reasons why they wanted to come back to the United States is because they saw that the Canadian marketplace for doctors was highly regulated," Pai said. "[There was] much less opportunity for them to be doctors, and entrepreneurial." "One of the things they loved about Kansas was that it was a small town where they could raise kids in a good environment, and also it was a market that allowed them to apply their talents to the maximum," he said. "And so they didn’t have to be government employees, they could be more entrepreneurial." Pai did not know he had the "political bug" until he was at Harvard, where he graduated with a B.A. with honors in 1994. At Parsons Senior High, his small public school in Kansas, Pai never had the chance to study the great scholars of economics, history, and political philosophy. Once in Cambridge, he found those subjects to be squarely in his "wheelhouse." "I started gravitating to more of the humanities courses," he said. "I ended up majoring in something called ‘Social Studies,’ which is something very few Indian parents want to hear their kids majoring in, but for me it was just intellectually fascinating." His interest drew him to pursue law, something his doctor parents took some time to warm up to. "I started off thinking, as a lot of Indian-American kids did back then, that I was going to be a doctor, because my parents were doctors," he said. "I can still remember when I told them I was going to law school instead of medical school." "They were a little bit worried, because in their minds lawyers were either criminal defense lawyers or medical malpractice plaintiffs attorneys," Pai said. "There was nothing else." "So they weren’t sure what that meant, but once I actually got to law school and started working they came to appreciate the choice." Pai’s worldview that a market is best when it is free from costly government rules and intervention was cemented from an unlikely source: President Barack Obama’s former regulatory czar Cass Sunstein. "It’s kind of counterintuitive because he obviously takes one view of regulation," said Pai, who studied under Sunstein at the University of Chicago Law School. "I’m sure you’re familiar with his work on ‘nudging,’ the government’s role of nudging people towards certain behaviors. What I loved about him though, aside from the fact that he was a great lecturer, he really forced you to honestly confront the dilemma of regulation, which is that it’s an imperfect tool to solving problems." While Sunstein and Pai disagree when it comes to regulation, he taught Pai the importance of cost-benefit-analysis. "The first step is to ascertain what the nature of the problem is," Pai, who grew up a Democrat, said. "He came to it with an appreciation of the fact that the government sometimes can’t figure out what exactly the problem is." "There’s always a cost to regulation and cost-benefit analysis was something that he stressed a lot," he said. "He was intellectually honest enough to acknowledge the line had to be drawn." "I can’t think of a more important principle in regulation," Pai added. "The government shouldn’t be doing something unless it’s going to produce more benefits than costs." David Currie, a constitutional law professor at the University of Chicago, and Martin Feldstein, an economics professor at Harvard, were also instrumental in Pai’s road to the right. Though liberal, Currie ingrained in Pai a respect for the constitution. Feldstein, the former chair of Council of Economic Advisors under Ronald Reagan, taught Pai the laws of supply and demand. "People are liberal or conservative, but if they share the same understanding about how economics works, they can at least agree on a basic set of core principles," he said. "I slowly but surely started gravitating over to the Republican side." Following law school, Pai clerked for Martin L.C. Feldman, a federal judge in New Orleans, who pushed him to apply for the anti-trust division in the Justice Department. He later went to work as an associate general counsel for Verizon, but couldn’t shake the allure of politics. He served as deputy chief counsel for two subcommittees on the Senate Judiciary Committee, before moving to the FCC in 2007. Four years later, Pai was named as the Republican commissioner, after being handpicked by Senate Minority Leader Mitch McConnell (R., Ky.). "As much as I wish I could say that my career had a lot of careful planning behind it, I tended to just follow the opportunities," Pai said. "I was lucky enough to have at every stage an interesting opportunity to serve in a public service position, and I took it at just about every juncture. When this came along, of course, I leapt at the chance." WASHINGTON — In his first days as President Trump’s pick to lead the Federal Communications Commission, Ajit Pai has aggressively moved to roll back consumer protection regulations created during the Obama presidency. 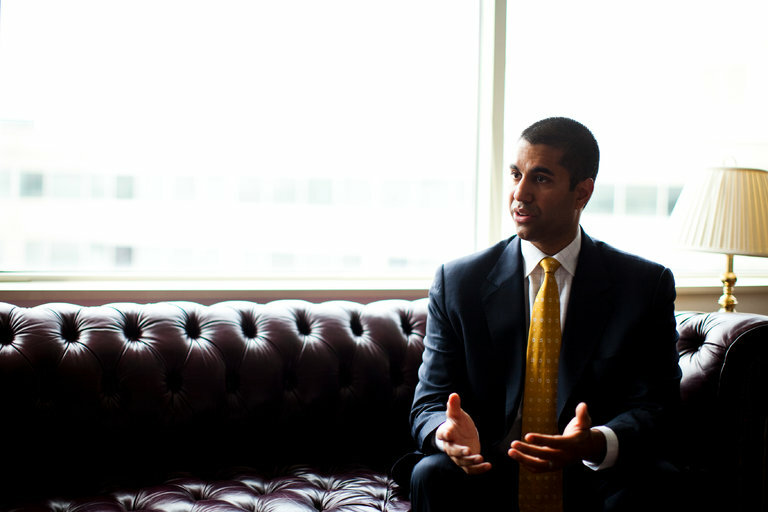 Mr. Pai took a first swipe at net neutrality rules designed to ensure equal access to content on the internet. He stopped nine companies from providing discounted high-speed internet service to low-income individuals. He withdrew an effort to keep prison phone rates down, and he scrapped a proposal to break open the cable box market. In total, as the chairman of the F.C.C., Mr. Pai released about a dozen actions in the last week, many buried in the agency’s website and not publicly announced, stunning consumer advocacy groups and telecom analysts. They said Mr. Pai’s message was clear: The F.C.C., an independent agency, will mirror the Trump administration’s rapid unwinding of government regulations that businesses fought against during the Obama administration. “With these strong-arm tactics, Chairman Pai is showing his true stripes,” said Matt Wood, the policy director at the consumer group Free Press. Mr. Pai, a former lawyer for Verizon, was elevated by Mr. Trump to the position of chairman after serving as a minority Republican member for the past three years. Known for being a stickler on conservative interpretations of telecommunications law and the limits of the F.C.C.’s authority, Mr. Pai said "...he was trying to wipe the slate clean." The efforts portend great changes at the federal agency at the center of the convergence of media, telecommunications and the internet. The biggest target will be net neutrality, a rule created in 2015 that prevents internet service providers from blocking or discriminating against internet traffic. The rule, which was created alongside a decision to categorize broadband like a utility, was the tech centerpiece of the Obama administration. On Friday, the F.C.C. took its first steps to pull back those rules, analysts said. Mr. Pai closed an investigation into zero-rating practices of the wireless providers T-Mobile, AT&T and Verizon. Zero-rating is the offering of free streaming and other downloads that do not count against limits on the amount of data a consumer can download. If a provider like AT&T offers free streaming of its DirecTV programs, does that violate net neutrality rules because it could put competing video services at a disadvantage? Under its previous leadership, the F.C.C. said in a report that it saw some evidence that made it concerned. But Mr. Pai said after closing the investigations into wireless carriers that zero-rating was popular among consumers, particularly low-income households. Last week, Mr. Pai said he disagreed with the move two years ago to declare broadband a utility. The reclassification of broadband into a service akin to telephones and electricity provided the legal foundation for net neutrality rules. Mr. Pai said he had not decided how he would approach the overhaul of broadband classification and net neutrality rules, but he faces legal hurdles. A federal court upheld the rules last year, and the commission could end up in a lengthy legal battle if he tries to scrap the rules. Mr. Pai will have the help of powerful members of Congress who have promised to attack the classification of broadband as a utility-like service. And he is popular among Republican leaders, including the Senate’s majority leader, Mitch McConnell, who with other members viewed Mr. Pai as a loyal voice of dissent during the Obama years. Mr. Pai, 44, the child of immigrants from India who settled in Kansas, is a fresh face for the Republican Party. Congress could introduce legislation that limits the agency’s ability to regulate broadband providers and enforce net neutrality rules. Also under attack are privacy rules for broadband providers. “The agency has strayed from its core mission,” said Marsha Blackburn, a Republican representative from Tennessee who oversees a telecommunications and tech subcommittee. She has called for a hearing within two weeks on the F.C.C. agenda under the new administration. Democrats in Congress said they would fight legislation that waters down net neutrality rules. They said Mr. Pai, described as a straight-A student of telecom law, would be a tough adversary, and they face great opposition from Republicans who have promised to prioritize the overturning of net neutrality rules. Most troubling to consumer advocates was the secrecy around Mr. Pai’s early actions. That included a decision to rescind the permissions of nine broadband providers to participate in a federal subsidy plan for low-income consumers. None of the providers currently serve low-income consumers, but Mr. Pai’s comments could foreshadow a shake-up of the Lifeline low-income subsidy program. On Monday, the F.C.C. is scheduled to appear before a federal judge to defend its push to curb extraordinarily expensive phone call prices from prison. But it told a judge a few days ago that Mr. Pai disagreed with many aspects of the case. Mignon Clyburn, the sole Democrat of the three sitting members of the F.C.C., warned that the actions would directly harm consumers. “Rather than working to close the digital divide, this action widens the gap,” Ms. Clyburn said. 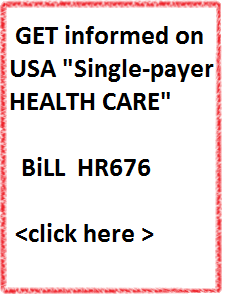 < See Susan's "Single-payer" USA Health CARE Research page. https://www.fcc.gov/ecfs/filing/10712798900239 < YES! The FCC has now published my comment. My USA Congress person - AND, my USA Senators - are shown on my politics page. On > ( "net neutrality rules") First, type what you want to say (your comment ) onto a Notepad document. This way, you can simply "cut&paste" your comment to the FCC; And, you will also have a copy - of what you posted - on your personal computer. ID = 10711647520920 < Susan does NOT KNOW what this "ID" is related to. Proceeding = 17-108 < This is the "internal FCC.gov" CODE that is required - to file a "NET NEUTRALITY" related comment. Name of Filer(S) = Michelle Doyon (PA) & Susan Marie Cassady-Neuhart (OH) - a UWGB "buckeye" YOU will place YOUR name in YOUR comment. 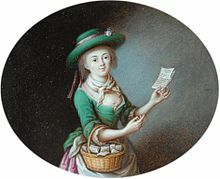 Brief Comment: For the people and by the people! Millions of middle class Americans depend on the Internet for their small businesses to thrive! The FCC's Open Internet Rules (net neutrality rules) are extremely important to me. I urge you to protect them. I don't want ISPs to have the power to block websites, slow them down, give some sites an advantage over others, or split the Internet into "fast lanes" for companies that pay and "slow lanes" for the rest. Now is not the time to let giant ISPs censor what we see and do online. Censorship by ISPs is [would BE] a serious problem. For example: Comcast has throttled Netflix, AT&T blocked FaceTime, Time Warner Cable throttled the popular game League of Legends, and Verizon admitted it will introduce fast lanes for sites that pay-and slow lanes for everyone else-if the FCC lifts the rules. This hurts consumers and businesses large and small. Courts have made clear that if the FCC ends Title II classification, the FCC must let ISPs offer "fast lanes" to websites for a fee. [Current FCC] Chairman Pai [appointed by Mr. Donald Trump] has made clear that he intends to do exactly this. But if some companies can pay our ISPs to have their content load faster, startups and small businesses [ similar to mine & Michelle's ] that can't pay those fees won't be able to compete. You [ The USA-FCC ] will kill the open marketplace that has enabled millions of small businesses and created the 5 most valuable companies in America -just to further enrich a few much less valuable "cable giants" famous for sky-high prices and abysmal customer service. Moreover, under Chairman Pai's plan, ISPs will be able to make it more difficult to access political speech that they don't like. They will be able to charge fees for website delivery that would make it harder for blogs, nonprofits, artists, and others who can't pay up to have their voices heard. Please, publicly support the FCC's existing net neutrality rules based on Title II, and denounce Chairman Pai's plans. Dear Mr. Irving (current GOdaddy CEO), YES! I support Net Neutrality! - as you (and Ms. Doyon) so elegantly describe it. https://www.fcc.gov/ecfs/filing/10711647520920 < This is the official link for Ms. Doyon's comment. In fact, I am a perfect example - of what Ms. Doyon & YOU are describing; that is, I am merely a senior, retired person - with a URL - and my very own (HTML) web site. I credit your company > [GOdaddy!] - with making it possible - that I can comment "in the Public Square" at all. I peddle nothing - but ideas - and, I believe in Thomas Paine. Consider, all that he had (in 1776) was a pamphlet. Today, we (the people) have the internet. The FCC confirmatio emailed to me says: "Thank you for your submission to the FCC Electronic Comment Filing System (ECFS). Please Note that your filing will not be available for searching until it has been reviewed and posted by the FCC. Confirmation Number: 2*1707***4****049, Proceeding(s): 17-108 : Restoring Internet Freedom, Filer(s): Susan Neuhart, Brief Comments: DATE: 7-12-2017 :: Dear Mr. Irving (current GOdaddy CEO), YES! I support Net Neutrality! - as you (and Ms. Doyon) so elegantly describe it. ... (see full comment above) I have a copy of the actual email - saved onto my computer.